When it comes to the psychic / spiritual realm, I wouldn’t call myself a skeptic, but I understand the feeling. Faced with whether or not they can take New Age ideas seriously, most folks fall into three camps: Really yes, really no, or open but unsure. For my video project, I wanted to counter the hard line approach and tackle the subject with an open spirit. 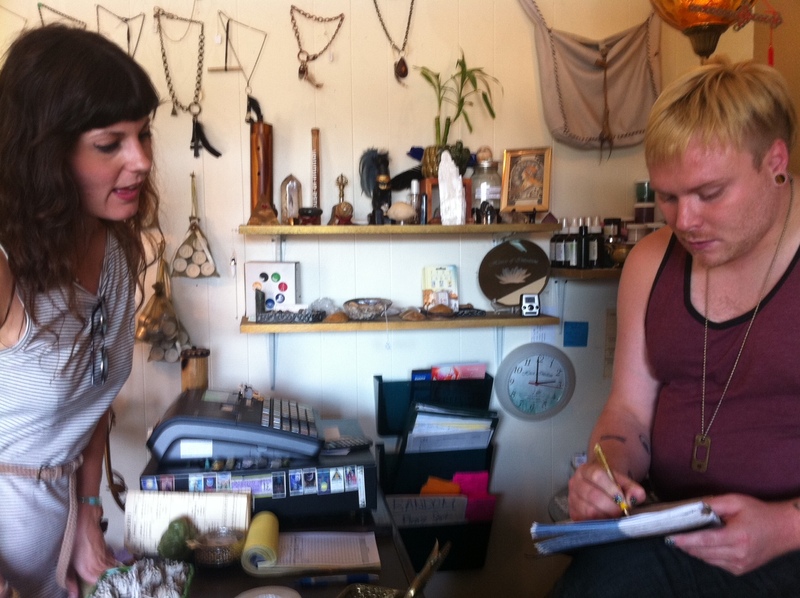 The House of Intuition opened in LA’s Echo Park neighborhood in March of 2010. 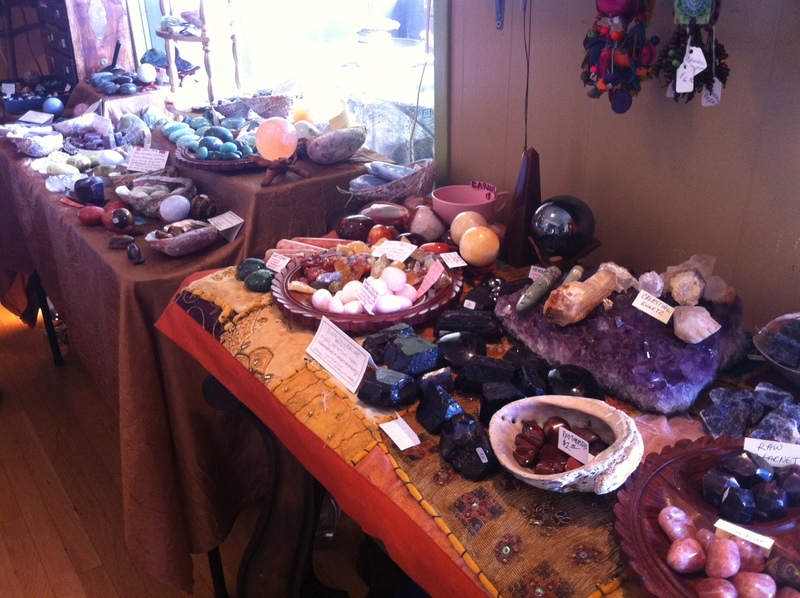 They serve up a New Age smorgasbord, offering everything from crystal readings to Reiki. 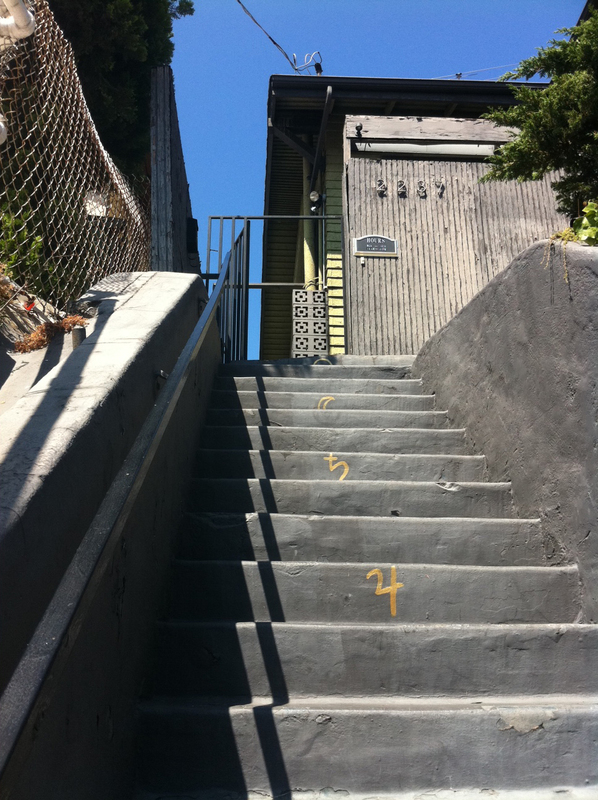 Just visiting the house is a total trip — you scale up a staircase on a sizable hill overlooking Sunset Boulevard like you’re journeying to an ancient temple. And once you’re inside, there’s enough enchantment going on to entertain the believers and skeptics alike. I wanted to capture that and explore what it was like to get an I-Ching reading, which isn’t commonly offered in psychic shops. (Intro music by Thievery Corporation. It was playing outside the store when I visited — you really do hear similar music when you walk up those stairs). Did you get all that? It’s a lot to process if you’ve never gotten a reading before. If you’re interested in the ancient Chinese divination process Maja used to gain access to my heart, check out this quick primer on the I-Ching. Special thanks to Maja D’Aoust for taking the time to talk and throwing in the quick reading. Maja has a really interesting background for an astrologer. She notes in the video that she’s “scientifically based” — beyond her Master’s degree in Transformational Psychology and I-Ching, she holds a Bachelor’s in biochemistry. She also hosts spiritual tours around LA. And her URL rocks: Godismyboyfriend.com. Big thanks also to the House of Intuition for being so accommodating while I made this video. If this video has made you excited or morbidly curious, they’re open from 10am-10pm every day. And of course, huge thanks to my excellent team members Sarah (who shot most of my B roll) and Paro (who spotted me and shot most of my interview). Great work comes from a great crew! The world beyond is just next door. Five staffers and two store managers keep the house running, offering psychic readings, tarot, I Ching, reiki and weekly workshops meant to help you tap into your own intuition. The psychic readers are a close family; together they create an open atmosphere where ideas and beliefs about the spiritual world are received and considered, free of judgment. One reason for the center’s success is its focus on spiritual support and healing. Many psychic shops are strictly business — come in, let me tell you about you, buy these crystals, pay and leave. At HOI, no one will push you. You’re free to browse the bookshelf, stare into one of the many crystals, smell the musky aromas of Dragon’s Blood and myrrh…and sit in the tea room to explore your feelings about the whole thing. Is this stuff for real? I plan to do a very brief profile of the shop while exploring its burgeoning role as a spiritual healing center in Echo Park and why it’s doing well when in an artistic, still up-and-coming neighborhood (psychics aren’t cheap and artists aren’t loaded). Questions to explore: How does HOI impact / influence the community? Is the shop working harmoniously with the Mexican Catholic community that has a distinct presence and legacy in the neighborhood? Also: How can sharp LA city slicker types actually take this woo-woo stuff seriously? Getting balanced reactions from the clientele will be a great way to get into this part of the story. Stylistic Approach / A/V elements / POV etc. There’s tons of eye candy in the store. The paraphenalia lining the shelves — crystals, trinkets, spiritual figurines, shiny jewelry — give a great sense of the magical vibe of the store. There are also some great areas to hang out — views of the street below, nice lighting shining on the balcony where people can rest after getting really intense readings. I also want to get a few conversations between psychics and clients, clients walking in, a sense of busy-ness in the business, faces of clients as they get their questions answered and/or are “enlightened.” Close-ups of the psychics as they read, maybe a shot or two of the tarot cards being flipped, the I Ching coins being dropped (I Ching readings aren’t as popular or widely offered as the tarot so this will be an interesting / exotic thing to feature). Sounds and shots of wind chimes are good ways to frame a mystical place. Get some shots in and around the Angelus Temple, the iconic church right on Echo Park Lake, to juxtapose elements of traditional versus New Age spirituality in the community. Find a way to tell the story about HOI’s background, where the psychic readers were born and why they came here (they’re not all from Echo Park). A quick shoot and edit session yielded this homage to my new USC friend and bastion of calm. My goals for my first video piece were to find a way to make a still subject “come alive” and manage to tell a story at the same time. Audio was a bit tricky — my opportune tour moment was interrupted by what I can only imagine was an airplane with sonic boom capabilities. I was able to use what I had and I think I got it it into decent shape despite the rough initial quality of the sound. A quick footnote: My best short-notice Google efforts yielded next to nothing in the search for more info on Evelia De Pie, beyond details of her creator and the benefactor who gave her to USC. I chose this statue as the subject of my favorite place piece because she made me feel something the first day we met. She’s a strong face, a warm presence and very good company. And she’ll always lend an ear. As a former four-year resident of LA’s Echo Park neighborhood, I was excited to find out I was placed in the group tackling this stretch of town for the class LA story project (Sarah gave a great account of the adventure her, Paro and I had today). Echo Park remains my all-time favorite place to live and hang out in all of the city. The main reasons: It’s cheap, it’s hilly, it has a brilliant arts scene and you’ll never want for a place to get great food or coffee. But the biggest draw for me is the feeling of community. Groups of friends gather in cafes, bookstores and bike co-ops to hang out or plan public events, and people will dare to travel from place to place without a car. It’s very un-LA. While scouting the terrain with my team there was one store in particular that I’d marked to explore: A one-stop psychic shop called the House of Intuition. The shop’s only been around since March 2010 — a relative newbie in a scene brimming with weathered landmarks — but it’s doing very well, welcoming scores of visitors every day for readings and classes and garnering a positive response on Yelp, the land of the brutally honest digital reviewers who can make or break your business (a five-star rating after 32 fairly thorough reviews? Those are some happy spirits). It’s interesting to consider the quick success of a psychic shop; even if your metaphysical-loving business can withstand the expected fiery blaze of skepticism, you still have to build a clientele that trusts your intangible abilities. A white inscription on the stone wall of the entrance suggests that “Your intuition led you here.” These stairs lead you up the hill to a mystical safe zone where Frankencense and Dragon’s Blood compete for full attention of your nostrils. Shelves are decked to the nines with every conceivable crystal. Five modest rooms beckon to seekers for readings from five staffers who specialize in everything from tarot to Reiki to I Ching. Robb Schlage tends this sacred space as HOI’s main Maitre d’. Robb, 28, is a transplant from Seattle who’s been working at the shop since it opened. A former salon manager who used to split his schedule between cities, he now spends most of his time keeping HOI’s wheels turning, booking readings, answering phones and serving customers tea. One notable perk of the job: Robb frequently attends various classes held at HOI. Psychics here hold workshops where you can learn to tap into your intuition, work with crystals or even connect with your spirit guides. 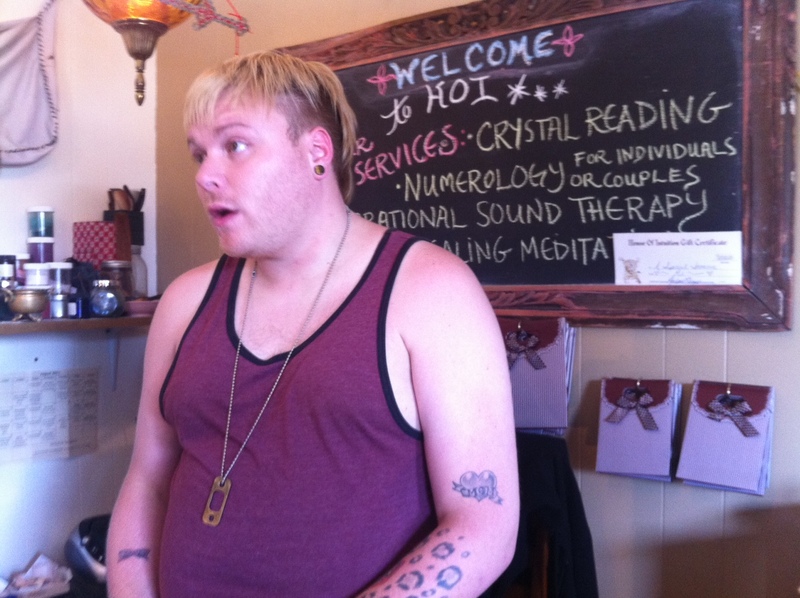 He says he’s been more spot on with his “psychic games” — tests of intuition he plays with others, including HOI owner and psychic healer Marlene (planning to follow up with her for more info). 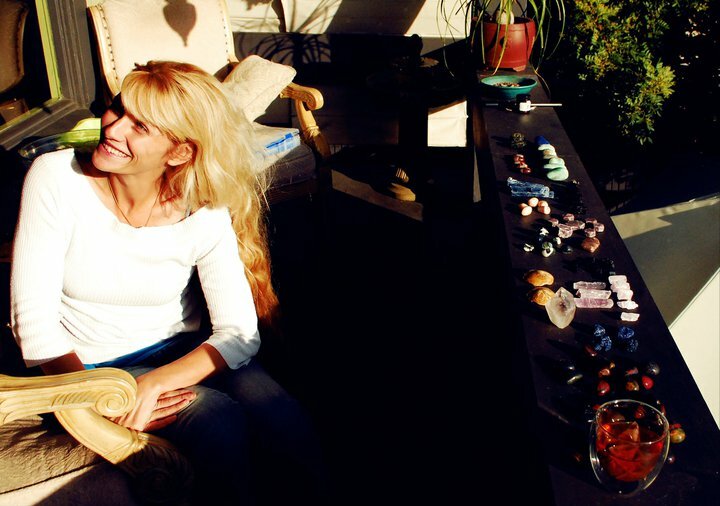 Psychic workshops, crystals, teas, incense, spirit guides — it’s a lot of New Age-ness to take in all in one sitting. Can HOI’s workshops really teach you to be psychic? How and why did the shop decide on Echo Park, of all places in LA? Does this suggest a certain spiritual openness to the community, which is also home to the famous Angelus Temple? My story seems to be a deeper look into the spirit and spirituality of Echo Park. Find out what the community believes and you can get closer to its heart. 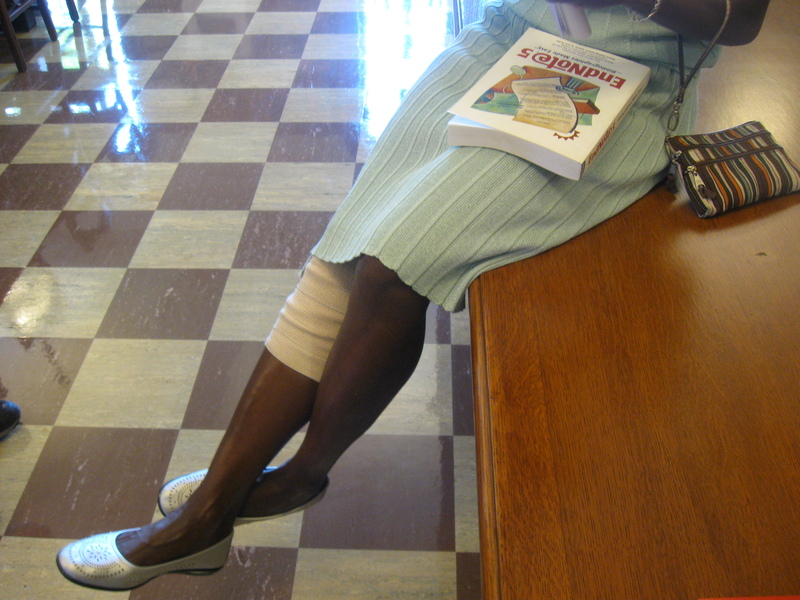 Chimene’s legs are crossed and dangling off the table as she answers my group’s questions about the library. There are several objects competing for my eyes’ attention, but it doesn’t really bother me. I love the composition (and honestly, I don’t think I know much of anything about composition, but it feels right to say). I love her purse and shoes, and I have terrible purse/shoe instincts. The shot is also loaded with potential prompts for Chimene: What is Endnotes 5? Are you brushing up for work? Is your knee feeling better since your recent surgery? Have you been able to cope and recoup on the job? More on Chimene: She’s under the close watch of a tightly-knit personal security team. 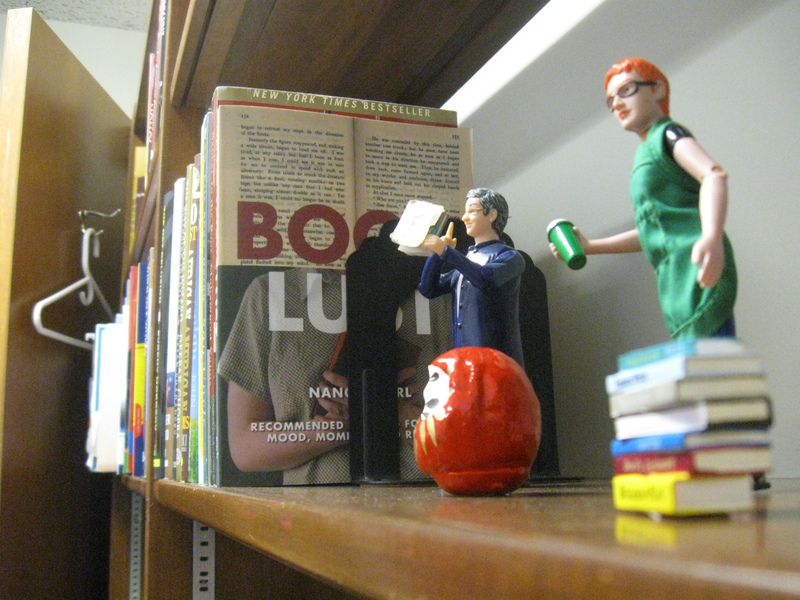 More questions: Are these librarian dolls? When did they come into your life, and how? Are they helpful on the job? Can I retake this shot with better focus? My last standout shot doesn’t have anything to do with Chimene (at least at first glance) but I felt it came out ahead of the rest. 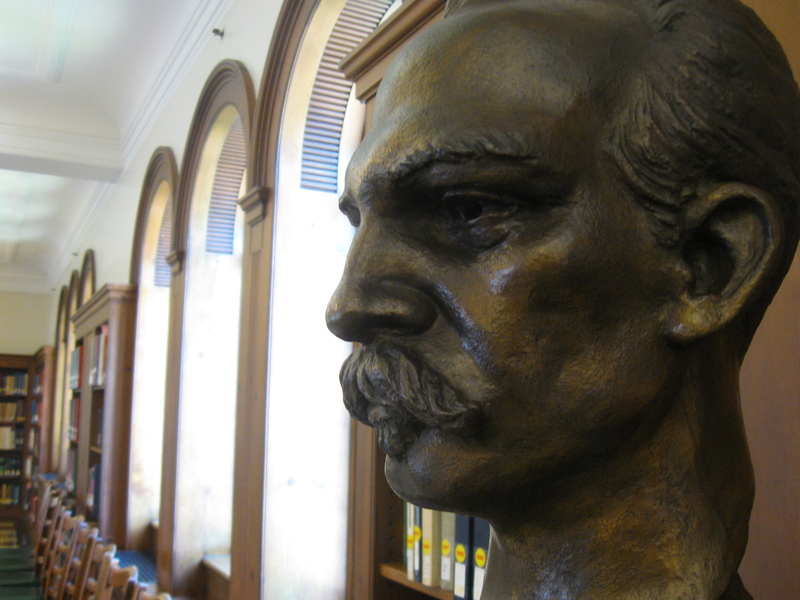 Questions that first pop into my mind on this bronze head: Who is this guy? I was so caught up with my pictorial bliss that I neglected to write it down (though I’d given myself permission because I knew we’d back the next day), but I must have taken at least 20 shots of him. Was he a significant benefactor? Is his presence in this room strategic? Did he invent something? Since I have so much info on Chimene, is there any way to find a connection between the two of them? Thus concludes this fast and loose tour of my firestarter three. The good news is I’m feeling surprisingly encouraged by my first attempts to pull questions from pictures, rather than use them to support answers. Good bookmark for tomorrow’s follow-ups. First, a warning: I tend to avoid watching audio slideshows. Whenever I start one up I get this feeling that I’m in the presence of a half-baked video — stick it back in the oven, its not done! But after having to watch a few I can see why and how they can be compelling when done well. My strong audio slideshow example comes from Miami Herald photographer Carl Juste, who narrates shots from Haiti through a strained whisper. Juste’s post-Earthquake photos are enough to ensnare a viewer without the use of audio; with Juste’s emotionally-delivered account of shooting in the country thrown in the mix, the piece becomes an instant standout. The story he shares is simple and corresponds seamlessly with the images. While the images are high quality, many of them don’t say anything — some are elegant mugshots, which don’t really forward the story. The audio only matches the visuals about 45% of the time, and the interview isn’t particularly interesting. While the subject of carbon monitoring may not be the most scintillating, there are always interesting elements you can pull out to draw the audience. I found my attention waning several times during the storytelling. The visuals kept me, but I stopped listening to the story. When I pulled my attention back to the interview, I was sorry I did. And just because I like you so much, here’s a bonus slideshow of an art gallery compilation, complete with music that misleads the viewer’s emotions by making all images lugubrious and sad, despite the potential for other more vibrant stories to be told. The intent may not have been to tell a story; either way I think they should have left the music out.